"Please, not on our birthday. You'll ruin everything." Inspired by a 1966 Life magazine article about Soviet conjoined twins, Brian De Palma crafted this tale of horror and suspense about Sisters, which predates his later horror films such as Carrie and The Fury, and mob classic Scarface. He was also responsible for The Untouchables, Mission Impossible and Mission To Mars. On this film he established his voyeuristic style, which he would revisit in later films, but which permeates throughout Sisters from beginning to end. After witnessing a brutal murder in the apartment across the street, aspiring journalist Grace Collier (Jennifer Salt, Soap) tries to get the police involved, but her previous editorials have them doubting her claims. After further insistence, the police join her in a search of the apartment in question, though no evidence of a crime or body is found, and its occupant, Danielle Breton, denies any knowledge of or involvement in the matter. The police detective (Dolph Sweet) dismisses the case, but Collier persists in the investigation, and begins to uncover the background of her suspected murderer by hiring a private detective (Charles Durning). 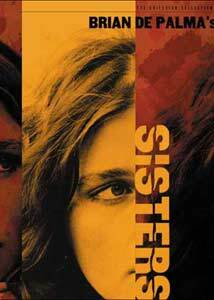 Margot Kidder (Superman films, The Amityville Horror) plays Danielle, who we find out is one of the Breton sisters, the first Canadian conjoined twins. Surgically separated only a year prior, Danielle's attachment to her sister was more than physical, though her sister Dominique is mentally unstable, and won't accept Danielle's relationship with her now estranged husband, Emil (William Finley, Phantom Of The Paradise, The Fury). However, things may not be as they appear, and as Collier digs deeper into the case, her part in the experience takes on a whole new dimension. Scored by film legend and frequent Hitchcock collaborator, Bernard Herrmann (Citizen Kane, Psycho, Vertigo), the film has a very dark feel to it, and keeps the audience guessing until the very end. De Palma uses a number of interesting techniques in this film, which separate it from other thrillers. There is no doubt we are in for something creepy as the title sequence involves images of fetuses set to Herrmann's moog and orchestral score. Psychologically, we are set up from the opening scene, as De Palma presents us with a reality that changes as we continue viewing (I don't want to elaborate too much here). There are also a number of sequences presented in split screen, where we watch simultaneous events from two perspectives, which adds to the urgency of these sections. De Palma also employs dream sequences to do his exposition, which adds to the surreal effect the film has as it gets further along. I have worded the above to reflect certain situations in the film without ruining the many surprises, but if you are viewing this for the first time, expect a bit of a ride. This does feature some pretty brutal violence, so it is not for the squeamish. The craft of the film is very well done, and the number of films De Palma pays homage to are detailed in the accompanying supplements on the disc, but, of course, include several Hitchcock films. Image Transfer Review: Criterion has produced a new 16:9 enhanced transfer from the original 35mm camera negative (and I'm assuming from the 35mm blowup of the parts shot on 16mm), so this is as good as it gets for this film. The image does contain a great deal of grain, which is rendered well, though is a bit distracting at times, primarily in dark sequences. Blemishes are extremely rare, and colors are generally quite rich. Any problems with the image are associated with the source, as no edge enhancement or digital artifacts are visible. I was not as impressed with this as I had expected to be, but this is the best it's going to get. Audio Transfer Review: Audio is also mastered from an optical print, and for the most part is quite acceptable. There is some hiss present, and there is some distortion during a few of the more dense areas of the score, though again, these seem like defects in the source material, rather than in the DVD mastering. 1973 Village Voice essay "Murder by Moog: Scoring the Chill"
Extras Review: On the disc, there are pair of text supplements in addition to Criterion's standard color bars. We get a 1973 print interview with De Palma on the making of Sisters, its stylings and the inspiration behind the film, a 1966 Life magazine article on Mesha and Desha, "Rare Study Of Siamese Twins in Soviet" that is also included. This supplement is presented with shots from the original article, with text extractions and closeups of the photos and X-rays originally published. There is also a section containing artwork and advertising from the original pressbook, all of which note a special "shock recovery" session following the film. An extensive still gallery rounds out the on-disc features. The included 12-page leaflet features De Palma's essay on the score, Murder by Moog: Scoring the Chill, as well as an in depth article on the film and one of the film's one sheet variations. English subtitles for the deaf and hard of hearing are also included. A wonderfully complex and disturbing film served up in traditional Criterion style with useful and informative supplements. This makes a good companion to another Criterion edition, David Cronenberg's 1988 masterpiece Dead Ringers, which also features twins as the lead characters. Though the print quality was below my expectations, I still would have to recommend the disc to fans of psychological thrillers.